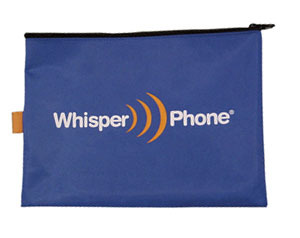 Storage pouches WhisperPhone to store your WhisperPhone and protect your WhisperPhone products. Our storage pouches are durable, reusable and eco-friendly. These pouches are perfect for traveling, storing in a desk or putting in a backpack. Available for WhisperPhone, WhisperPhone Element and WhisperPhone Duet.